Istanbul. Arrive today in Istanbul, a city at the meeting point of two continents—Europe and Asia. You'll be met by our representative and escorted to your centrally located hotel. This evening, join your fellow travellers for a welcome dinner and briefing with your guide. Istanbul. This morning, visit some of the unique and iconic sites in the city. Start your tour at the Sultanahmet Mosque, known as the Blue Mosque for the tiles and paint adorning its interior. Built between 1609 and 1616 on the site of several previous palaces, is considered to be the last great mosque of the classical period, and even today it is a truly epic sight. More than 200 stained glass windows admit natural light, the floors are covered with thick carpets, and the walls are decorated with incredibly intricate tile work and verses from the Qur'an, many by Seyyid Kasim Gubari, the greatest calligrapher of his time. 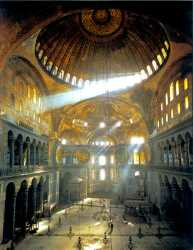 Later visit nearby Hagia Sofia, also known as Ayasofya, built by the emperor Justinian I between 537 and 543 AD. The Hagia Sofia is famous for its massive dome and Byzantine architecture, which inspired much of the Blue Mosque. Built as an Othordox basilica, it later became a mosque and finally a museum in 1935. Spend the remainder of the morning at the Grand Bazaar, one of the largest and oldest covered markets in the world. The bazaar was opened in 1461, and today there are over 1200 stores, many of which are grouped by the type of goods, with special areas for leather coats, gold jewelry and other wares. The balance of the day is at leisure to explore this fascinating city, or take one of our optional tours. Optional Excursion: This afternoon, enjoy an optional tour of Topkapi Palace, residence of the Ottoman Sultans for more than 400 years. The palace became a museum of the imperial era in 1924. The palace complex has hundreds of rooms and chambers, the most important being accessible to the public today. The palace houses a large collection of porcelain, robes and armor, as well as Ottoman miniatures and jewelry. In the evening, you may also choose an optional Istanbul by Night with dinner and show, experiencing local cuisine and folklore. Breakfast provided. Istanbul & Ankara. Depart for Ankara, the capital city of Turkey, called Angora by the Romans. 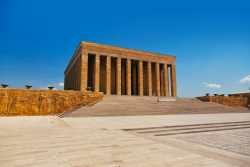 This afternoon, visit the Mausoleum of Ataturk, the leader of the Turkish War of Independence and the founder and first president of the modern Republic of Turkey. Later visit the Museum of Anatolian Civilizations. The museum includes Anatolian artifacts from many excavations including Assyrian trading colonies, Hittite, Hellenistic, Roman Byzantine and Ottoman periods. There are exhibits of gold, silver, glass, marble and bronze works as far back as the first century, as well as an extensive coin collection. Ankara & Cappadocia. 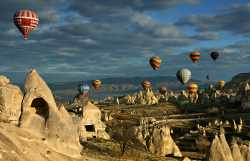 Travel into the interior of Turkey to Cappadocia. En route, see Tuz Gölü, a huge saline lake fed by streams and rain, but with no outlet. In the summer, the lake dries and exposes a thick salt layer, which is mined to produce most of the salt used in Turkey. The area is also protected as a breeding area for flamingoes and other birds. 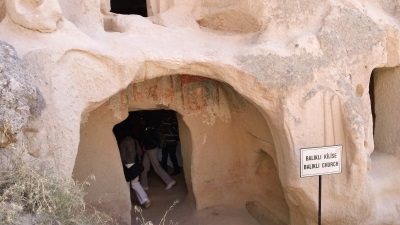 Continue to one of the famed underground cities of Cappadocia, carved out of the soft tuff. Early Christians built these structures as a refuge from the persecution of the Roman Empire. With several floors, tunnels and rooms spanning for miles, they could shelter thousands of people together with their livestock and food stores, and had living quarters, churches, storage rooms, stables, wells, ventilation systems, and even wine and oil presses. Next, visit the pottery makers in the city of Avanos on the banks of the Kizilirmak River, where the red clay from the riverbanks is excellent for traditional household pottery, bricks and roof tiles. Continue to your hotel for dinner and overnight. Cappadocia is the land of the fairy chimneys, and is today a UNESCO World Heritage site. The area is famous for its rock formations and underground cities. In the early morning, weather permitting, you may choose an optional balloon ride. 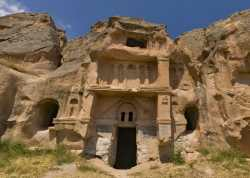 Visit the Open Air Museum in the Goreme and Zelve, where you will see early Christian churches decorated with frescoes. Enjoy the magnificent fairy landscapes and rock castles of Avcilar, Dervent Valley, Pidgeon Valley and Uçhisar Foldings. Return to your hotel for dinner. Optional Excursion: After dinner, you can join the optional outing to see the Whirling Dervishes dance performance. "Dervish" is a common term for an initiate of the Sufi path, and the whirling is part of the formal "Sema" ceremony by participants known as semazens. The unique and fascinating whirling dances were inspired by Mawlana Jalaleddin Rumi, one of the great mystics of Islam. Breakfast & dinner provided. Cappadocia & Antalya. Continue your journey, driving south towards the Mediterreanean resort of Antalya. En route, visit Sultanhan, a "caravanserai" (caravan palace) built as a resting place for the camel caravans, which has a stone-paved hallway and other impressive fortifications. Upon reaching Konya, the capital town of Konya province, you'll visit the Mevlana Museum, where Rumi, a Sufi mystic, poet, and the founder of the Mevlana "Dervish" order, is buried. Drive through the Taurus Mountains to reach Antalya. Accommodations: Crowne Plaza Hotel Antalya or similar. Breakfast & dinner provided. Antalya Enjoy a day at leisure to explore the town of Antalya, situated on coastal cliffs and surrounded by mountains. Today is a bustling city and resort area. Take one of the optional tours to Aspendos and Perge in the morning and the Duden Waterfalls in the afternoon—or both. Optional Excursion: Aspendos, located beside the Eurymedon river, is renowned through the world for its magnificent ancient Roman theater, famous for its perfect acoustics. Perge, one of Pamphylia's foremost cities, was founded after the Trojan War by colonists from Argos. 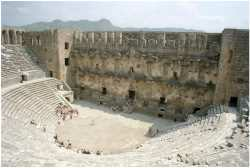 The city is very well preserved with a theater, stadium, and Agora. Return to Antalya. Optional Excursion: In the afternoon, visit the Duden Waterfalls. The Duden River flows through the Taurus mountains, creating a drop of thundering water. There are even stalagmites and stalactites due to the high content of minerals in the water. Breakfast & dinner provided. Antalya & Pamukkale. Leave the coast for Pamukkale, meaning "cotton castle" in Turkish. 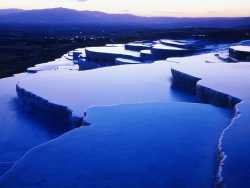 The city contains hot springs and stunning white terraces that look like ice, created by carbonate minerals left by flowing water. Visit the city of Hierapolis, also a UNESCO World Heritage site, where the hot springs have been used as a spa since the second century. See the great baths constructed without the use of cement. The town was also settled by Jews from Babylon and Mesopotamia, exiled by Antiochus the Great. Continue to Laodicea, one of the early Christian communities mentioned in the New Testament. Accommodations: Richmond Hotel. Breakfast & dinner provided. Pamukkale, Aphrodisias & Kusadasi or Izmir. This morning, visit the Roman city of Aphrodisias, whose large excavation was funded by the National Geographic Society. Ancient artists produced sophisticated statues inspired by Aphrodite, Goddess of Love and Marriage, for whom the town was named. Visit the Temple of Aphrodite and the local archaeological museum which houses a wonderful collection of the art of Aphrodisias. Ephesus. Today, visit the glorious city of Ephesus, founded more than 4000 years ago, the capital city of the Roman Province of Asia Minor. The Temple of Artemis, one of the Seven Wonders of the Ancient World, is represented by one column and fragments of a frieze. 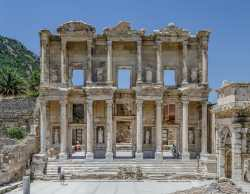 Walk through the ancient streets to view the magnificent structures such as the Library of Celsus, Temple of Hadrian, and the Great Theater. Ephesus is also the town where St. Paul and St. John lived during the first century. Continue to the House of the Virgin Mary, where Mary spent her last years living near a grove of olive trees. A visit is considered a pilgrimage by the Vatican. Enjoy the evening at leisure, perhaps dine at one of the many local restaurants. Kusadasi, Pergamon, Troy & Canakkale. 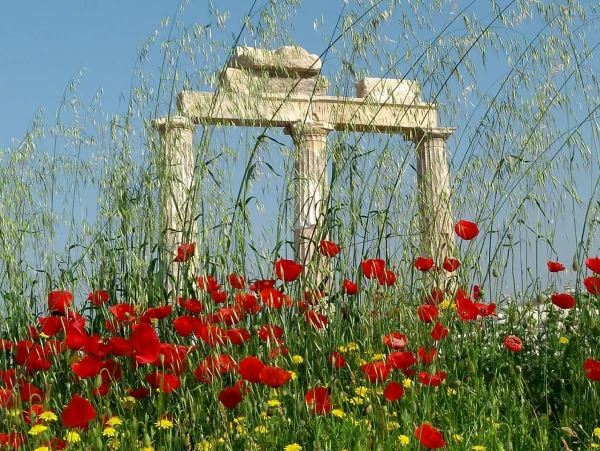 This morning, visit the ruins of Pergamon, the capital of a powerful kingdom during the Hellenistic period in the first century. Visit the Acropolis structure which houses the Temple of Trajan, the Sanctuary of Athena and the Altar of Zeus. When papyrus became scarce, the Pergamenes invented a new writing material made of fine calfskin which they called pergamena (parchment), a predecessor of vellum. The Library of Pergamon, built by King Eumenes II and containing as many as 200,000 volumes, was second only to the library of Alexandria, Egypt. 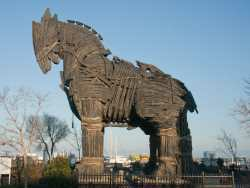 Finally, visit the ancient city of Troy, best known as the focus of the Trojan War as described in the epic poem by Homer. The ancient city today is an expansive archaeological site and a UNESCO World Heritage site. Dinner and overnight at your hotel. Accommodations: Kolin Hotel Canakkale or similar. Breakfast & dinner provided. Canakkale, Dardanelles & Istanbul. Continue north by ferry across the Dardanelles, a narrow straight connecting the Aegean Sea with the Sea of Marmara. This strait, like the Bosphurus in Istanbul, separates Europe from Asia. Visit the site of Gallipoli, where one of the fiercest battles of World War I took place. The Gallipoli campaign was the first major battle undertaken by the Australian and New Zealand Army Corps (ANZAC). The struggle laid the grounds for the Turkish War of Independence and the foundation of the Republic of Turkey, led by Mustafa Kemal Ataturk. Continue to Istanbul for an afternoon at leisure. Alternatively, you may choose an optional cruise on the Bosphorus. Optional Excursion: Cruise the straits that separate Europe and Asia, passing by the villas and palaces of the Ottoman empire, as well as little fishing villages. The route zigzags across the straits for picture-perfect views of Istanbul and the Bosphorus Suspension bridges. This optional excursion can only be purchased locally. This evening, join your fellow travelers for a farewell dinner. Accommodations: Crowne Plaza Istanbul. Breakfast & dinner provided.